Get your 3D printed architectural designs worldwide, and quickly. Save time and stand out of the crowd with amazing study models. 3D printing architectural models has never been so easy! 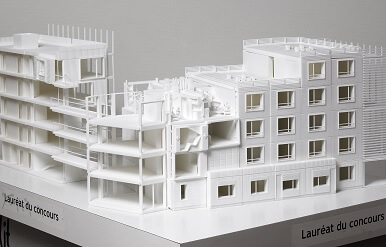 Forget about Foamcore, we produce white architectural models in any format you may need for an improved representation or to showcase multiple alternatives on the initial phase of your project. With additive manufacturing, it is easy to 3D print entire urban sections. Our plastic and resin materials are strong and durable enough to be easily transported and safely handled. The multicolor material is also a great alternative to represent your ideas and accelerate your design workflow. 3D printing for architecture is a growing application of additive manufacturing. You can realize concrete structures, and 3D printed houses, for instance. Here at Sculpteo, we mostly help you get 3D printed models to showcase your ideas. Present effectively your ideas to a jury or other professionals with a 3D printed Competition Model additionally to your Proof of Concept Model. 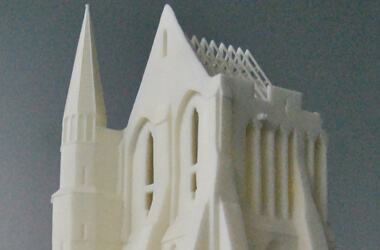 3D printing architecture models will be a true asset for your project. We 3D print architecture monochromatic models in large sizes: up to 27” in a single run and we can carefully section your model if it is bigger. 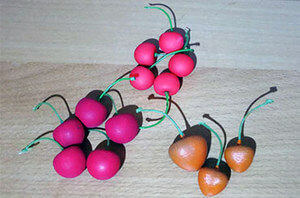 The main advantage of 3D printing is that we can produce any model regardless of its shape, even for one single unit. 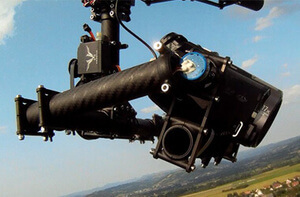 It is the ideal fabrication method for Competition or Graduation models. Promotional scale models: Make your clients visualize your imagination. Promotional 3D printed models and concept models are a key component on virtual tours to promote your real estate project. Since seeing is believing, they allow your investors or future clients to project themselves in your program and increases your chances of success. Three-dimensional plans, cutaway drawings, city-scale models. Sculpteo prints realistic scaled models of a wide range of sizes according to the promotional needs of your sales department, showroom or during a professional trade show. Thanks to the 3D printing technology, reduce the time it takes you to get your 3D models and become the next leader of the construction industry. Sculpteo also 3D prints full color scaled models or plastic models that you can use as customized promotional models for your clients. 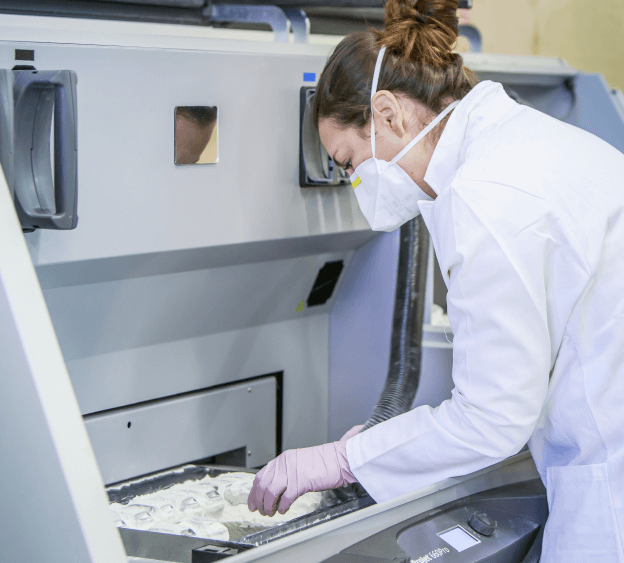 We're working with a range of full-color or monochromatic high-grade 3D printers that offer excellent accuracy (layer thickness from 25 to 150 microns). Embrace the true potential of 3D printing in architecture now! Time is money, right? No need to wait until Monday morning to get a quote, do it online! Our exclusive 3D tools allow you to check the solidity of the walls and how details will render. There's no minimum order to discover the benefits of 3D printing: we 3D print your model starting at 1 copy. If you are not in a hurry, we can offer you a cheaper price. 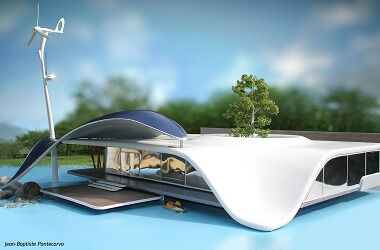 the ARchitecture industry professionals have chosen Online 3D Printing! I am very happy with my collaboration with the Sculpteo team, who were fully involved in the project and highly responsive. This competition architectural model has been 3D printed with the polyamide laser sintering technology for the architect company 'Roubert Ravaux Clément architects', 'Svenn Architectures' and Mr. Benoit Vanneste. They are the winners of the contest organized by ALT and OSICA called 'sustainable and solidarity housing'. This designer chose a full-color material and white plastic material in order to create his study models for the Teo Villa. Teo Villa is a very innovative self-sufficient green housing project; 3D printing was used to perfectly simulate the shapes of the roof and to create the model of the wind turbine. In order to 3D Print, you need to send us a 3D file that you can easily design with a 3D modeling software (or CAD Software). For beginners, we suggest a list of free software and offer free tutorials to help you get a 3D printable file. 25+ 3D file formats are accepted on sculpteo.com! You just need to upload and we'll give a feedback and a quote for your custom part in seconds. We also provide optimization tools to help you to get your scale model at the best price. Tip: white plastic is best for architectural models. We deliver your order at the place of your choice so you can make unique architectural models! Items are usually shipped 48h after your order. Looking for some advice on finishing? Have a look at our tutorials about painting and finishing. Your architectural model and your prototypes can be printed in more than 50 materials and finishes. They include our plastic material with multiple polishing options and colors, our resin and transparent resin, our multicolor material and different 3D printing metal options like sterling silver. Thanks to our unique technologies, you are able to analyze and repair your 3D file in seconds, review the solidity of the future 3D print and even hollow the inside of the model to make it cheaper to print. Through a vibrant community, our support and all the resources we produce (tutorials to get a great 3D printed model, tips on the 3D printing technology, 3D design examples, best practices in product design, etc. ), we are here to give the best advice to use the latest 3D Printing technologies and save your time. Our blog highlights many case studies and provides deep industry-specific analyses. Prototypes and tools to build or calibrate your machinery in the food industry. 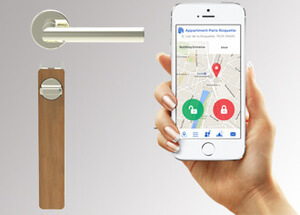 Prototypes and functional parts for Consumer electronics and BtoB electronic devices. Discover 3D Printing benefits for IoT and automation.